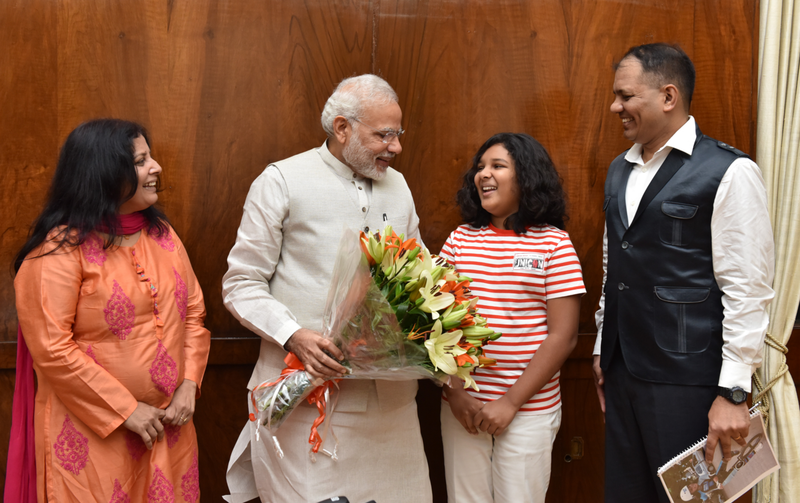 Before leaving for Russia to climb Mt Elbrus, Aryan Balaji got a chance to meet India’s Prime Minister Narendra Modi. Aryan Balaji, an 11-year-old Indian boy, will attempt to climb Mount Elbrus, Europe’s highest mountain (5642m) located in Russia, in few days. If he does he will become the youngest Indian to climb the peak. RIR spoke to the young adventurer before his trip to Russia’s Caucasus. A few hours before catching the flight to Mineralnye Vody, a town in Southern Russia, from where 11-year-old Aryan Balaji will begin his historic adventure to Elbrus peak, the young boy Aryan was enjoying his chicken tikka sandwich in a cafe in South Mumbai. Aryan will be accompanied on the adventure by his father, Commander KS Balaji, an Indian Navy officer and experienced mountaineer, and his mother Riki Balaji, a skydiver. “There won’t be any Indian food available at Elbrus,” Aryan’s mother explained, adding that the family will have to survive on very simple Russian food with no spices but enough proteins to fuel their bodies for the challenge. The family began their adventure on August 20, after arriving at Terskol, the high-level village in the Baksan canyon. They will have to spend several days at various heights to get acclimatized and brush up their climbing skills prior to attempting the summit. The family will take the route via the south face and the Azau Valley which is commonly used by climbers. The climb to Elbrus from this route starts at the Barrels Hut (‘bochki’ in Russian), the base camp located at 3900 metres (12,795 feet) or Priyut 11 station at 4157 metres (13,638 feet) and further up past the Pashtuhova Rocks at 4670 metres (15,321 feet) up to the Saddle between the peaks at 5,416 metres (17,769 feet). The last 150-200 metres lead up to the West peak at 5642.7 metres (18,513 feet). The climb may take between nine and 11 hours, while the descent usually takes about three to six hours. “Stamina is very important; you need to be very strong to climb this mountain. And of course the weather, the cold will be one of the biggest challenges,” Aryan told RIR. “I have been preparing myself daily for this by walking 10 km a day, cycling, doing various exercises for strength and stretching, I even do yoga because yoga helps in maintaining your breath and increasing lung capacity”. According to specialists, Mt. Elbrus is not a technically difficult mountain compared to many other peaks, including those in the “seven summits” list (seven highest mountains of the world's seven continents). However, the altitude change, harsh weather with strong winds and freezing temperatures becomes a challenge for the mountaineers, even experienced ones. For this reason, Elbrus is considered one of the world’s most deadly peaks to scale with 15 to 30 people losing their lives here every year. When asked if he is frightened to climb Elbrus, Aryan smiles politely: “Rather, excited”. He has already accomplished Everest Base Camp (5364 m) and Mt Kala Patthar (5545m) when he was seven years old and Africa’s tallest mountain Kilimanjaro when he was seven years and ten months, Mt Shitidhar (5250 m) and Friendship Peak (5289 m) in the Himalayas when he was eight and a half. In his young age Aryan is not only a mountaineer but also a diver, unicyclist, skater, sailor and golfer, actor and model. Aryan received National Child Award in 2014 from the President of India for his achievements in Sports, Adventure and Social Service and The Gandhi Seva Medal in 2012 for community service. Aryan is preparing to climb Everest from the north side (Tibet) in 2018, he stated in his ‘Mission Possible’ Everest 2018 Quest, designed back in 2010. A Grade VI student at the Mahatma Gandhi International School in Port Blair, where he has been living for half of his young life, Aryan is a class topper and a dedicated student. His frequent trips do not prevent him from following up with the studies. “We have a group on WhatsApp and my friends send me the notes there while I am travelling to climb mountains,” Aryan said. Mt. Elbrus has a long record of children mountaineers from many counties who have successfully scaled the peak. 10-year-old Ivana Pencheva from Bulgaria scaled the summit in 2013, and in 2015, 11-year-old Tyler Armstrong from United States climbed Elbrus. The record so far belongs to 8-year-old Ivan Bukanov from Zhukovsky city of Moscow region, who scaled Mt. Elbrus in 2012. This summer, around eight climbers from India have already climbed Mt.Elbrus. Among them, a 13-year-old boy from Pune, Tanish Khot, who accomplished this mission along with his father Rutuja Shah. In 2015, another 13-year-old Indian mountaineer, Jaahnavi Sriperambuduru from Hyderabad, climbed Elbrus. In July 2014, several Indian women in their early 20s, scaled Mount Elbrus. The expedition included Saachi Soni, Akriti Heer and Arunima Sinha, who acquired international recognition as the first woman amputee in the world to climb Mount Everest. According to the Balajis, Russia’s Mt. Elbrus is becoming more and more popular among Indian mountaineers, although there are many gaps to be filled in the way information about the mountain and facilities available for climbers becomes easily accessible for Indians. “From what we could read online, we understood that there could be some problems with food, especially suitable for India, sanitation may be a problem since toilet and garbage management infrastructure is not well maintained. For climbers, health should be the first priority because you need strength to climb the peak,” Riki said, adding that not many agencies in India provide tours to Elbrus and working through a local agency is unavoidable, despite the language barrier which can often be a problem. “The Russian agencies often do not speak English that well, but at the same time we understand that we need local agency, local guides who know the mountain,” Riki adds. The family approached the Russian Information Centre (RIC) in India for help in organizing the tour to Elbrus. Officials at the RIC believe that Elbrus can become a new destination for Indian tourists seeking something more than exploring the heritage attractions of Russia’s major cities of Moscow and St. Petersburg. Located in the South of Russia, Elbrus is just 700 km drive from Sochi, Russia’s summer beach resort and host of the 2014 Winter Olympics. Elbrus is not only a destination for mountaineers but an alternative for extreme sports activists as the mountain’s slopes has favorable conditions for skiing and modern snowboarding all the year round. Since 2014, government agencies along with private operators have been developing a modern ski resort infrastructure around Mt. Elbrus which, according to Northern Caucasus Resorts (JSC NCR), has received nearly 150,000 tourists in the first quarter of 2016.